Many situations require a highly portable, high-powered light source that can illuminate a required worksite. 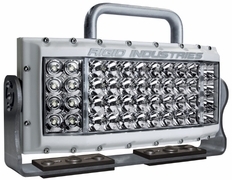 Whether it�s an emergency scene, a mine or industrial application, a remote pit in Baja, or a harbor slip, whatever the situation, Rigid Industries� Site Series provides the flexibility to light any area and provides the mobility to easily move the lighting source with changing conditions. Featuring Rigid�s all new 80/40 Optic, Hybrid Flood and an 80/40, Hybrid Spot Combo, the Site Series offers a wider area of coverage than comparable lights from the competition. The Site Series� handle and tilting brackets make adjustments and moving the light easy for the user. Additional mounting options are sold separately.